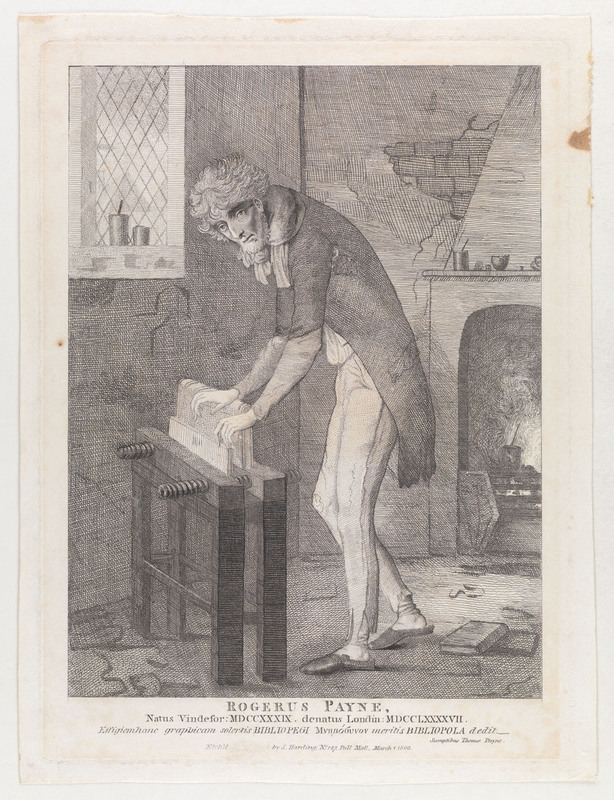 I suppose most bookbinders are familiar with this depiction of Roger Payne. I first encountered it as Plate 59 in Edith Diehl’s Bookbinding: Its Background and Technique, which was the second book on bookbinding I read in 1988. The scene is often referred to as a “dingy garret”, though to be fair, many slightly later depictions of binderies, ca. 1830’s, are in a similar state, with cracked plaster, dirty looking walls, etc…. There is something appealing about the scene, a locus of honest, if impecunious, craft. His timid, almost mouselike glance conveys an earnestness. He seems weak, leaning on a book in press to support his thin frame. The press tub itself is so dinky I can’t imagine using it to back a book — how would the press itself stay stable on it? The book on the press is also in an odd position. It is difficult to believe a binder would press down on the spine like this, when the book is only supported by the foreedge boards. There are other oddities. Why are there books lying on the floor? Why is he wearing slippers and torn pants? Should we chalk it up to the artistic imagination of the artist who drew him? And what are in the three pots that have spoons or brush handles sticking out of them? Are they barley broth pots as one theory advances, which he was supposedly fond of? Or are they glue pots? The one in the brightly burning fire would likely be too hot and ruin the glue. The one on the mantle might be a good temperature to actually use. Could the one in the window be kept cool for storage? Or, again, are we back to speculating about an artist’s imagination. We do have actual evidence of Payne and his work, found in the books he bound, and his invoices, written in his own hand, and very detailed for the time. 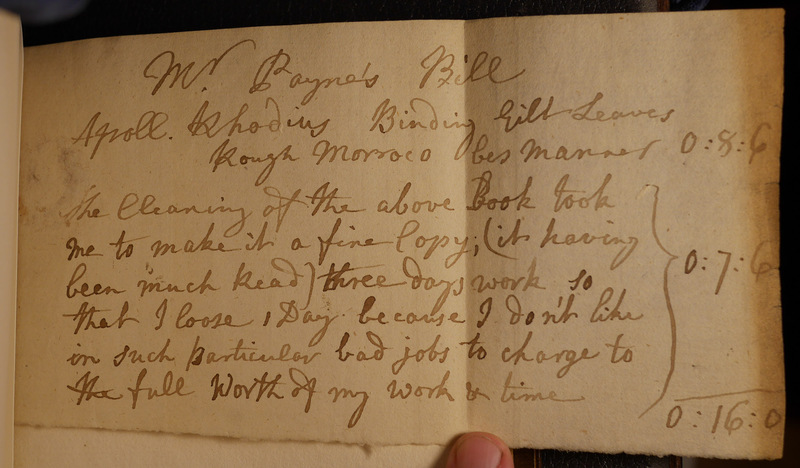 Handwritten bill from Roger Payne, The Morgan Library and Museum. # MA 3889. There is a collection of 35 of them bound together at the Morgan Library and Museum. Accession Number: MA 3889, Unfortunately, they are separated from the books that he bound. What a loss! There are a number of Payne’s bindings in the Morgan’s collection. While they do not reveal the mystery of his pots, they do reveal a kind and conscientious bookbinder, as in the above bill. He mentions reducing the price by one days work because he wasn’t happy with the quality of the result. His bindings are beautiful, with his often lauded tooling, carefully handled straight grain morocco, and often exceedingly thin boards that are invariably dead flat even today. He is still a role model! Previous PostPrevious Two Awesome Looking New Books From The Legacy Press. Tim Barrett’s European Papermaking and Pablo Alvarez’s Translation of Paredes’ Printing Manual. Next PostNext A Very Long Tool Roll. And Fantastic Students at The Conservation of Leather Bookbindings Workshop, Emory University.